Russell Robinson may be a professor of music education at the university level, but his research focuses on a younger breed of student. Robinson’s work is with junior and high school choruses, and the lack of quality music available to them. Robinson turned his lessons into a DVD called Creative Rehearsal Techniques for Today’s Choral Classroom, essentially a workshop that teaches time management and how to achieve quality music. 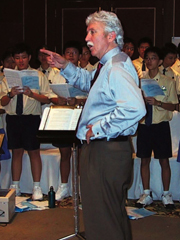 The DVD is now used by choral teachers internationally, along with two books he wrote: The Complete Choral Warm Up Book and Songwriting Made Easy. Robinson is furthering his research agenda with several pieces for beginning choruses. His new DVD, Jazz Style and Improvisation for Choirs, is aimed at junior and senior high school choirs and consists of a 15-step pedagogical plan. Robinson has more than 250 choral arrangements in print, which are performed worldwide by elementary, junior and high school choirs. He has conducted at Carnegie Hall, the Hong Kong Youth Chorus in China, the Linz Austria Festival, Boston Symphony Hall and at the White House, and he is a sought after consultant worldwide, including Europe, the Far East and Africa. “Dr. Robinson brings international attention to the School of Music, the College of Fine Arts, and the University of Florida through his ongoing activities throughout the world,” says John Duff, director of the School of Music.